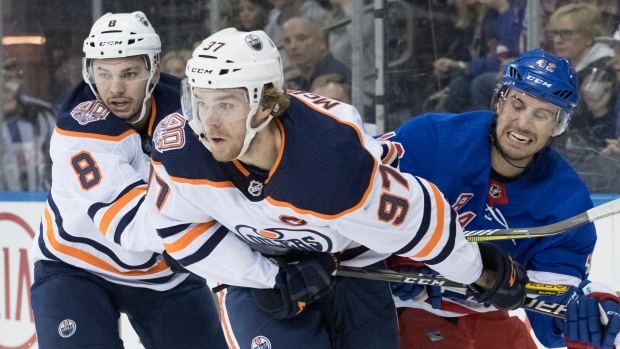 NEW YORK — Cam Talbot had every reason to celebrate as the buzzer sounded and the Edmonton Oilers cemented their first win of the season. Mika Zibanejad opened the scoring for the Rangers with 7:11 to go in the first period. The fleet Zibanejad took a pass from defenceman Marc Staal and put the puck past the former Talbot. Defenceman Brendan Smith also assisted on Zibanejad's first goal this season. Nugent-Hopkins tied it with 5:43 left, tapping a rebound past Lundqvist for his first this season. Defenceman Darnell Nurse — playing his 200th NHL game — and McDavid assisted. Lundqvist made 25 saves and the Rangers defence was steady for the most part. But timely scoring has emerged as a problem area as New York has started the season with four losses in five games. Quinn — who made the leap from Boston University to the NHL when he replaced Alain Vigneault after last season — said he is seeking a fiercer approach when his squad has the puck.